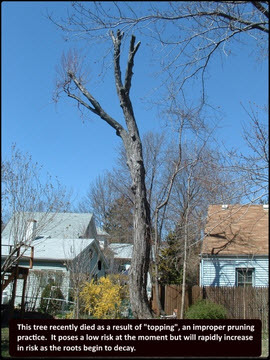 When a property owner asks a consulting arborist if a particular tree is a hazard, what he or she is often really asking, in tree care industry terms, is "is this a high risk tree". The risk posed by a tree is dependent on the likelihood of a tree failure occurring, combined with the severity of the potential consequences of such a failure. Tree risk is a much less subjective concept and the level of risk posed by a tree can be defined in relatively concrete terms by having a "tree risk assessment" performed by a qualified arborist. Today a "qualified arborist" usually means an arborist who has attended specialized training, and passed an examination, to become "tree risk assessment qualified" through the International Society of Arboriculture (ISA). In order for a tree to be considered as posing a risk it must meet two criteria. 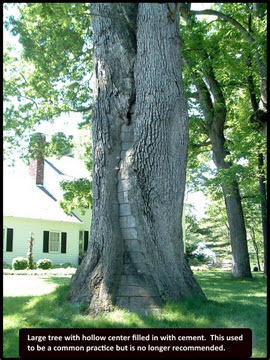 The tree, or a tree part, must be at an increased likelihood of failure, usually due to the presence of some structural defect e.g. the presence of a significant amount of decay in a portion of the tree, and there must be one or more targets present. A target may be any person or property that could potentially be damaged or injured should a failure occur. If there are no targets present there is no risk and the tree will not be considered a hazard, even if it is structurally unsound and likely to fail at any time. If we have a tree that meets both of these conditions; it is at an increased likelihood of failure due to some defect, and there are one or more potential targets present that could potentially be affected by such a failure, then the tree will be considered to pose some level of risk and that level of risk should be evaluated. During the risk assessment process, the following questions will be answered: what is the likelihood of the tree, or tree part failing; what is the likelihood of the failure impacting a target; how severe are the potential consequences if the failing tree or tree part does impact the target. The likelihood of the tree experiencing a failure will depend on the magnitude of the structural defect present combined with the site conditions on which the tree is growing. For example, a tree limb possessing a large amount of internal decay is usually more likely to fail than the same size limb having a minimal amount of decay. The likelihood of failure is also influenced by the site conditions. The same limb is more likely to fail, within a specifically defined timeframe, if the tree is located on an open, windy site, than if that tree is growing in a location where it is protected from strong winds. Assuming that this limb does fail, what is the likelihood of it impacting a target? If the limb is stretching over the roof of a house, then the likelihood of impact will be nearly 100%. If the limb is over a back country road that only sees a dozen cars pass by in any given day, the chance of the failure impacting the targets, in this case the passing vehicles, will be low. Finally, if this same limb is hanging over a bus stop where people are standing approximately 50% of the time in any 24 hour period, then the chance of the failure impacting the target would be somewhere around 50%. If the limb fails, and it does impact the target, how severe are the likely consequences? In the case of the limb growing over a house, the damages would likely be limited to the monetary expense required to repair the roof. In the second and third examples, the limb striking a moving vehicle or a group of people, serious injuries are likely to occur and so the consequences may be considered to be significantly more severe. These variables are all taken into account in developing a description of the total tree risk assessed. This description may take the form of a qualitative rating, such as: low, moderate, high, or extreme. Or it may be expressed on a point scale with higher numbers representing a greater risk than lower figures. Either way, the risk assessment itself does not answer our starting query "Is this a hazard tree?". As noted in the opening paragraph, a hazard tree is one that poses a level of risk to people or property that exceeds the risk tolerance of the property owner or manager. Therefore, a conversation must take place between the arborist assessing the risk and the tree owner where the arborist explains the level of risk present and the tree owner expresses his or her risk tolerance. It is this conversation that will set the definition of a "hazard tree" for that particular property. 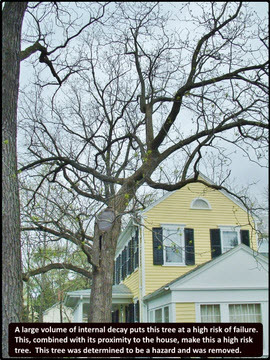 A tree with a moderate risk rating may be considered a hazard on one property and a tree with an identical risk rating may not be considered a hazard in another. Of course the property owner, or other individual responsible for making tree risk management decisions, should take care that their personal definition of a hazard does not stray too far from what might reasonable be considered to be a hazard by someone else. This is especially true when the risk posed by one of their trees extends to targets located beyond their property lines. When a tree failure occurs, "Act of God" or negligence, can be a fine line and that is the stuff that lawsuits are made of. Christian J. Plunkett, BCMA, is an independent Consulting Arborist with 14 years of experience in the fields of Arboriculture and Urban Forestry. He is a skilled diagnostician with extensive experience in the areas of Tree Health Care, Tree Risk Assessment, and Appraisal of Tree Value. Mr. Plunkett has distinguished himself within his profession by earning the highly respected ISA Board Certified Master Arborist and New Jersey Certified Tree Expert credentials. He is also ISA Tree Risk Assessment Qualified. 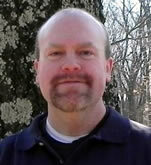 Mr. Plunkett is a graduate of The Pennsylvania State University and holds a BS in Urban Forestry. He is a member of the International Society of Arboriculture and the American Society of Consulting Arborists.